Farmhouse La Mirabelle in La Jarge, Lorigne, Deux Sevres, France - Quiet Setting In A Peaceful Hamlet, A Good Centre For Exploring The Surrounding Areas. 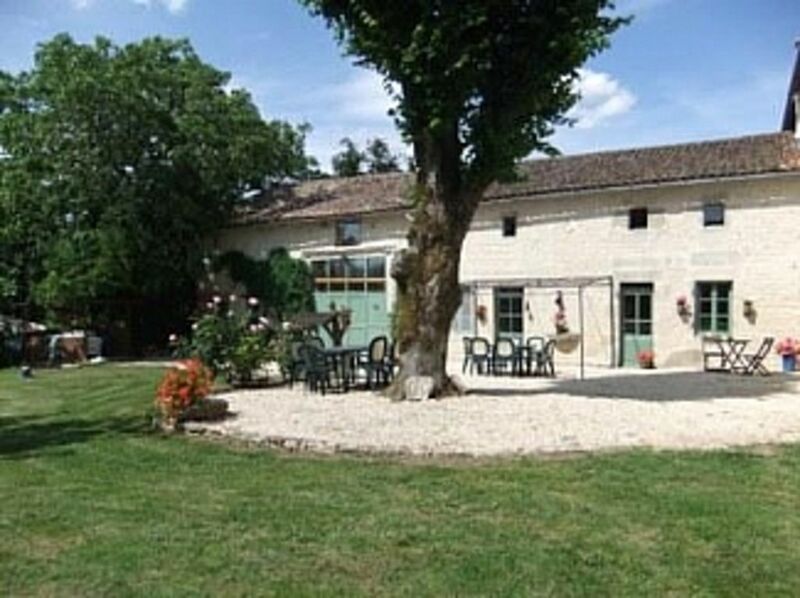 An attractive and spacious farmhouse offering the comforts of home with old France appeal. Perfect for large families or groups, with room enough, in + out, for it not to feel crowded. The fully equipped kitchen is big enough for 12 to enjoy their meals, sitting, enjoying each others company. The homely sitting room has 3 comfortable sofas to chill out in, or to enjoy the warmth of the wood burners in cooler times. The swimming pool is private. The garden, approx one acre, has sun all day with natural shade in various areas, the best of both worlds! In the barn there is a games room which, "keeps the kids, of all ages occupied for hours". Utility Room: Contains washing machine, iron/ironing board and clothes hanger/drier. A homely sitting room with wood burner & comfortable settees, a place you can relax with a book, watch TV, free view channels, or DVDs. A small library with choice of books, games, jigsaws etc, with kiddies corner with child sized table and chairs. 5 burner gas hob with large oven. Large fully equipped open plan kitchen diner. microwave fridge/freezer, dishwasher, coffee machine, toaster, + all usual gadgets. Full of character with exposed stone and beams & wood burner. Available for hire, approx' 20 mins distance, on the river Charentes. There are 2 tennis courts available in Sauze Vaussais the nearest town at 5 min drive. Notes on accommodation: The gite is comfortable and spacious, there are two reading areas on the upstairs landings for those quite moments, and the communal areas with enough room for large groups. The kitchen/diner with it's large family table, perfect for enjoying a meal together, reviewing the day, enjoying the company over a good bottle of wine or two! Outside there is a well, securely covered to keep the little ones safe, and the large garden with plenty of room to spread out, mostly laid to lawn, with shrubs and fruit trees, with plenty of open space and also natural shade, with the pool and terrace situated to get the most from our sunny weather. In the folly is a bespoke BBQ where 'dad' can do his thing, burn the sausage, charcoal the chicken, that kind of thing! Outside: Step out of the gite onto a large terrace with tables and chairs leading to the spacious sunny garden which is completely fenced and private. Several seating areas, a bbq area and swings in approx one acre. A 8m swimming pool with wooden terrace and sun beds makes the relaxation perfect. The garden enjoys sun for most of the day but with the benefit of plenty of natural shade for those who wish it. Lots of room for the children to run safe and free. A few flower beds which we maintain, and fruit trees, with elder flower, damson, cherry, fig and pear, and also a fine walnut tree. The fruit is there for the picking when ripe, so please take advantage. The property is entered through the front gates and leads to off road parking area for 3/4 cars. Utility Room: Contains washing machine, iron/ironing board and clothes hanger/drier. Cleaning / Towels / Linen / Maid service: Bed linen, kitchen linen and shower mats are included, however please bring your own bath and swimming towels. The gite is cleaned and the beds are made before your arrival, and is expected to be left tidy and in good order. The end of stay cleaning is mandatory. Other: The games room has table tennis, 5ft. snooker/pool table and dart board to keep the kids, of all ages occupied for hours. It also stores various kinds of garden games. Nous avons passé un très bon réveillon dans le gîte de Brigitta et Tim. La maison a beaucoup de charme et est idéale pour les groupes avec enfants ! Nous avons beaucoup apprécié le grand salon et son poêle ou tout le monde a pu trouver sa place (nous étions 12). Merci à Brigitta et Tim, des hotes accueillants et soucieux de notre confort. Nous avons séjournés chez Brigitta et son mari dans leur "cottage anglais". Un accueil très sympathique et chaleureux. La maison est très agréable et le jardin vraiment bucolique. Tout est réuni pour un séjour confortable et relaxant. La région renferme également beaucoup de belles surprises culturelles. En conclusion, une adresse à recommander vivement. Merci encore à Brigitta et son mari. Nous sommes heureux que vous ayez passé un bon weekend ensemble à la mirabelle. Nous vous avons trouvé tout le monde très sympathique et superbe hôtes. Merci encore et nous espérons, à bientôt. Maison charmante et adaptée aux petits enfants. La literie est malheureusement fort ancienne. La Rochelle (80 mins) With its beaches, wonderful aquarium, marina and ancient harbor area where you can sit watching the world go by eating moules and frites in one of the fine restaurants sipping a cool glass of white wine. Isle de Re (90 mins) is definitely worth a visit with its wonderful seafood restaurants, lovely beaches and picturesque fishing villages. The best way to explore the island is by bicycle which can be hired on the island. The area has it’s own micro-climate with the second highest sunshine hours after the Provence. We are located in the heart of the Poitou-Charentes and bordering the regions Charente and Vienne, with daily requirements all close at hand' and a great variety of tourist attractions to discover. Le Marais Poitevin, also well-known as the Venice verte, very lovely, boat hire available to explore the small rivers and canals, great for a day out. Futuroscope, an interactive theme park near Poitiers interesting for all ages, great fun. Vallée de Singes, (the valley of the apes) keep hold of your hat and sun glasses! There are many small zoos, animal parks and theme parks to visit. The 'Velorail', traveling by pedal power, have fun and get fit! Aquatic centre, with diving, hamman facilities and a good restaurant, Numerous medieval towns, Romanesque churches, chateaux and gardens are all worth visiting. Horse riding centre, tennis courts, swimming pools, kayaking/canoes for hire on the River Charantes, lake fishing, and lake beach are all close by. The area is well known for cycling and hiking, there being 2 cycle routes just 50 meters from our entrance to choose from. We do have a number of bicycles on site, for hire at reasonable rates. Through-out the year there are festivals and traditional markets within easy driving distance. In the gite there is a folder with extensive information about markets, places of interest and leisure activities. Or maybe you prefer to stay home enjoy a massage and relax. A great way of easing some of the tensions of modern life. We are always available to help and advice, please don't be shy, it's what we are here for. Booking Notes: Booking form on request and payment is in Euros. We require 25% deposit to secure your booking with the balance payable 8 weeks prior to your arrival. Bookings made within eight weeks of arrival must be paid in full to secure booking. We require, a security deposit of 250 Euros against breakages and damage. This will be returned after the property has been checked at the end of your stay. Heating charge including wood for log burners: 20€ for 3 days and 45€ for 7 days in low season if necessary and as required. Changeover Day: In Peak Season changeover day is Saturday. Arrival after 4pm. Please try to advise approx arrival time. Welcome pack provided. Departure by 10am. Changeover days can be flexible in mid/low season. We can supply 1st evening meal, saves you cooking, please ask. Notes on prices: Prices are in Euros. Property can also be let to a group of up to 6 people daily rate € 100.= weekly rate in low season = € 450 / in mid season = €570 or let to a couple, weekly rate in low and mid season = €395.= Fancy Christmas away from it all? You like Log fires, country walks, peace and quite? We are open, give us a call. Special requirements? Please ask, perhaps we can help!